The ART TUBE MP Project Series Preamp for Microphone and Instrument can also make your voice sound fabulous, warmed and made silky smooth by the genuine 12AX7A tube inside. A makeover of the popular original, the Tube MP features an ultralow-noise discrete mic preamp front end that has an extremely flat, wide frequency response and can handle very low and high signal levels with minimum coloration. High impedance instrument input bypasses the mic preamp circuitry for a shorter signal path. External power supply minimizes AC line noise and hum. Input gain control and switch maximizes dynamic range of input and lets you control how hard you drive the tube. 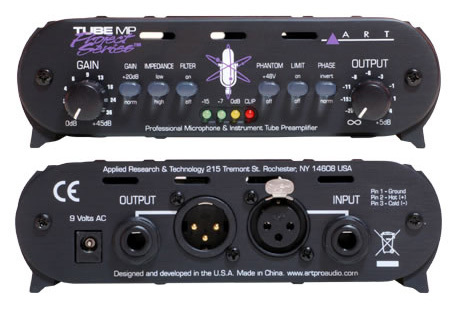 Switchable input impedance on the XLR in optimizes mic response. Bessel switchable low-cut filter removes rumble and wind noise. Set at 40Hz, it won't overly affect bass tonality. XLR input features phantom power of +48V DC from a very quiet internal high voltage power supply. The Tube MP Project Series Preamp has an FET limiter with fast attack and musical release times that protect other gear in the chain without compression. This allows you to maximize the dynamic range of your signal before converting to digital. A phase invert switch lets you switch signal polarity at the source to minimize cancellation. Output control after the tube and limiter matches output level to a wide variety of systems. Added output section at the end of the signal path has enhanced signal drive capability to both output jacks.